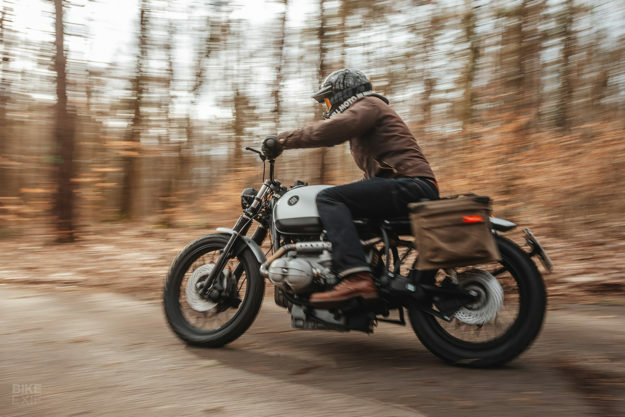 The battle between form and function rages on a daily basis in the custom scene. 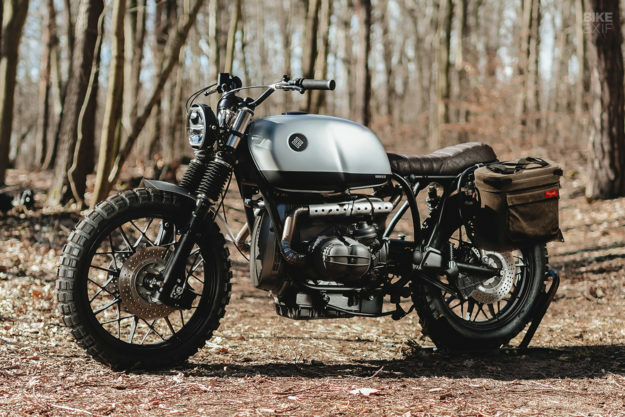 As much as we hate to admit it, some customs are destined to spend their lives on display, or seldom ridden. But for every show pony, there’s a workhorse out there. 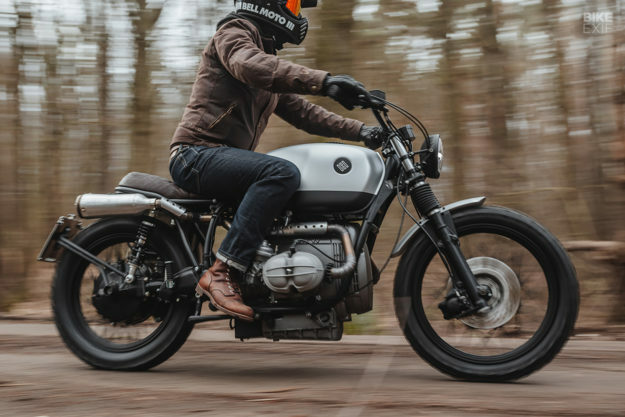 Like this thoroughly practical—yet still handsome—classic BMW boxer from Hookie Co.
‘Racoon’ is based on a 1979 BMW R100/7, and was built with reliability and day-to-day performance topping the brief. “Nothing special,” says shop boss, Nico. 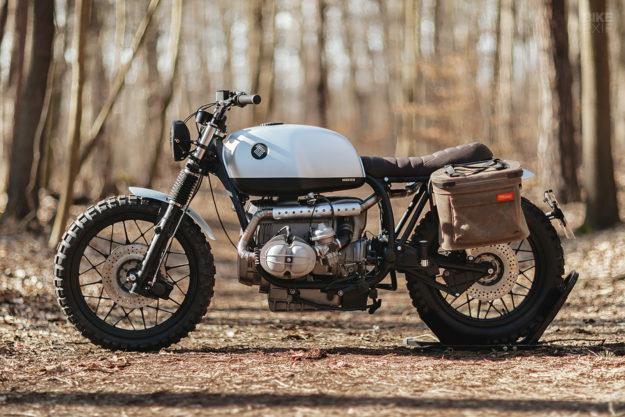 On the surface it’s a simple, well-packed scrambler in Hookie’s typically minimalist style. But the Dresden shop went to town to bring this airhead up to spec. For starters, they yanked out the motor and sent it to specialists Sport-Evolution, for a full rebuild. Then they repainted it in a dark grey metallic color, and media blasted the valve covers for a like-new finish. The original Bing carbs are still in play, as is the airbox. “Because reliability,” quips Nico. Hookie simply installed a new, upgraded air filter. 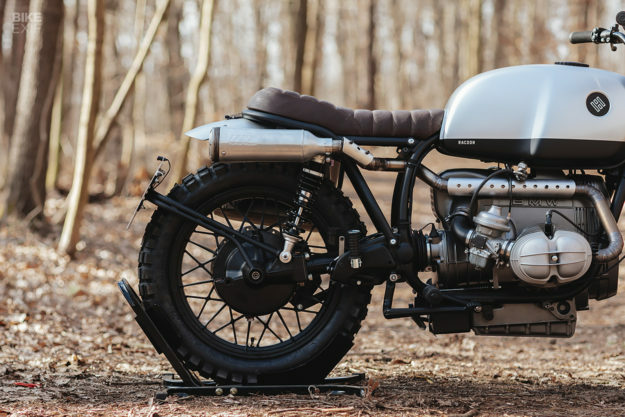 Combined with the fresh motor, this Beemer should be good for another few decades. Moving to fabrication, Hookie built up a new subframe with a subtle kick in the tail. 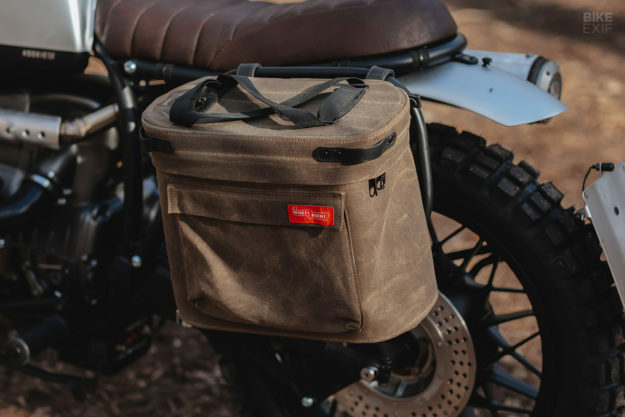 It’s capped off with a dark brown leather saddle, designed just long enough for a passenger or a bit of luggage. Also out back is a hand-built bracket to hold the license plate and rear turn signals. It’s surprisingly well finished for what is normally a mundane part, right down to the Hookie Co. logo, and the way the struts mount to existing points on the swing arm. Practicalistas will happily note the presence of hand-rolled aluminum fenders at both ends. The guys also installed a set of YSS shocks out back, and Continental TKC80 tires for all-round use. The wiring’s also been brought up to date, with a full re-wire around Motogadget’s ubiquitous m.Unit controller, and a Lithium-ion battery. 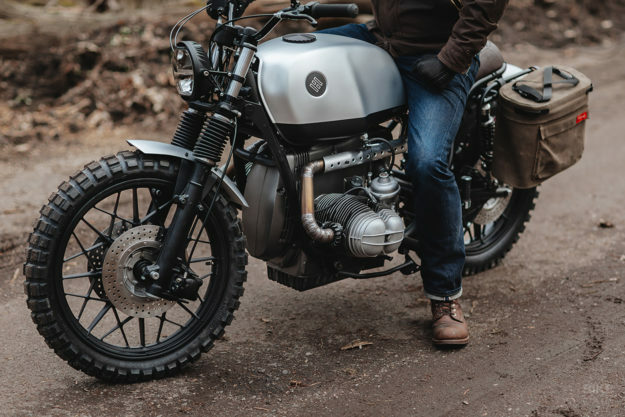 The turn signals and tiny (yet bright) taillight are all LED items from Kellermann, and there’s a powerful Koso LED headlight, mounted on LSL brackets, out front. 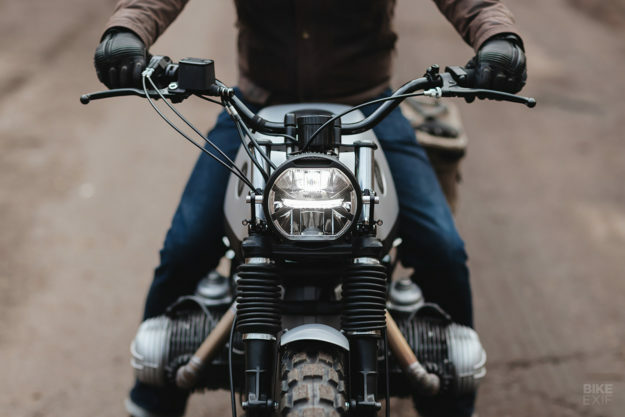 Up in the cockpit, you’ll find LSL handlebars, Biltwell Inc. grips, a Koso speedo and Motogadget switches. Hookie also installed a Brembo master cylinder, a new, slim gas cap, and new foot pegs all round. Everything’s wrapped in a subtle monochrome paint job, courtesy of Hookie’s painter of choice, Adrian Flor. Bits like the wheels and frame have been redone in flat black to round it out. 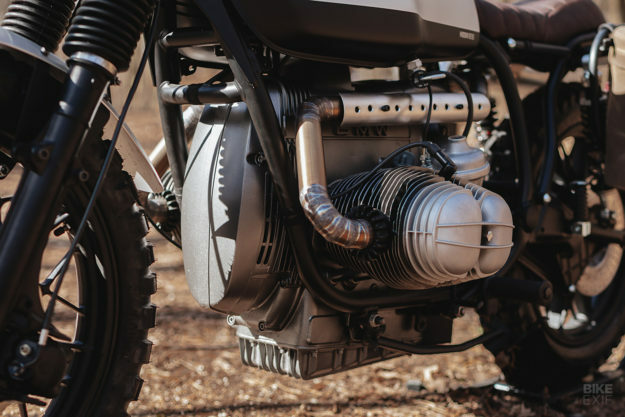 The biggest scrambler hit comes from the high-mounted SuperTrapp exhaust. Hookie fabricated a set of stainless steel headers to get it where they wanted it—routing them close to the motor. We asked how sensible the setup is, and Nico assured us that there’s heat resistant foil and heat shields in all the right places. And their client’s tested it too. Right after taking delivery, he put it through a one-day. 500 km shakedown with zero issues. 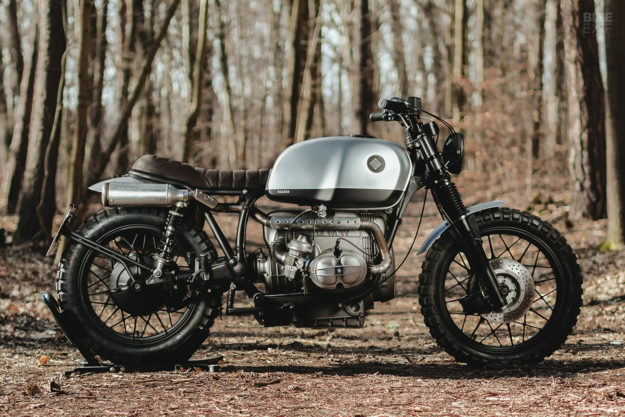 Proving that custom motos can look good and be practical, all at the same time.